, Jonathan, a painter, and a writer on the art of painting, was born about 1665. He was intended by his father-in-law, apprentice to a scrivener, with whom he lived six years, but by the death of his master, was enabled to follow the bent of his inclination for painting. He then became the disciple of Riley, with whom he lived four years, and finally connected himself by marrying his niece. The degree of skill which he attained, by no means corresponded with the ideas he entertained of the art, which were certainly of a just and elevated kind. There are, however, great strength, roundness, and boldness in the colouring of his heads, which are drawn and marked in the manner of Kneller, with freedom and firmness; though the attitudes in which they and his figures are placed, the draperies which clothe the latter, and the back-grounds from which they are relieved, are insipid and tasteless. 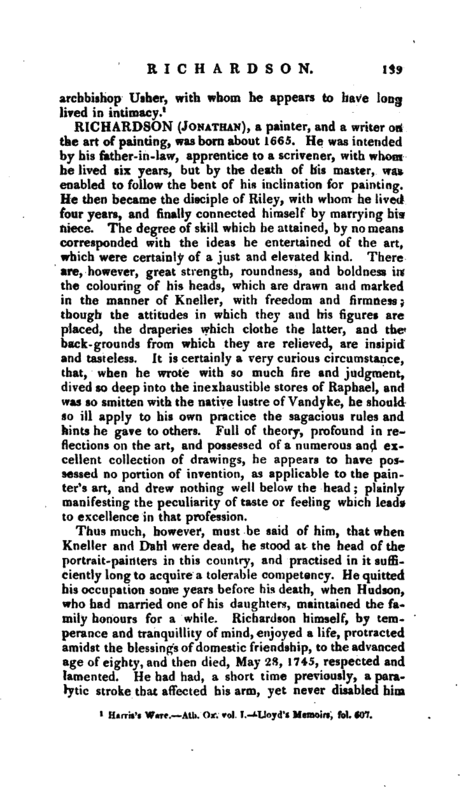 It is certainly a very curious circumstance, that, when he wrote with so much fire and judgment, dived so deep into the inexhaustible stores of Raphael, and was so smitten with the native lustre of Vandyke, he should so ill apply to his own practice the sagacious rules and hints he gave to others. Full of theory, profound in reflections on the art, and possessed of a numerous and excellent collection of drawings, he appears to have possessed no portion of invention, as applicable to the painter’s art, and drew nothing well below the head; plainly manifesting the peculiarity of taste or feeling which leads to excellence in that profession. Thus much, however, must be said of him, that when Kneller and Dahl were dead, he stood at the head of the portrait-painters in this country, and practised in it sufficiently long to acquire a tolerable competency. He quitted his occupation some years before his death, when Hudson, who had married one of his daughters, maintained the family honours for a while. 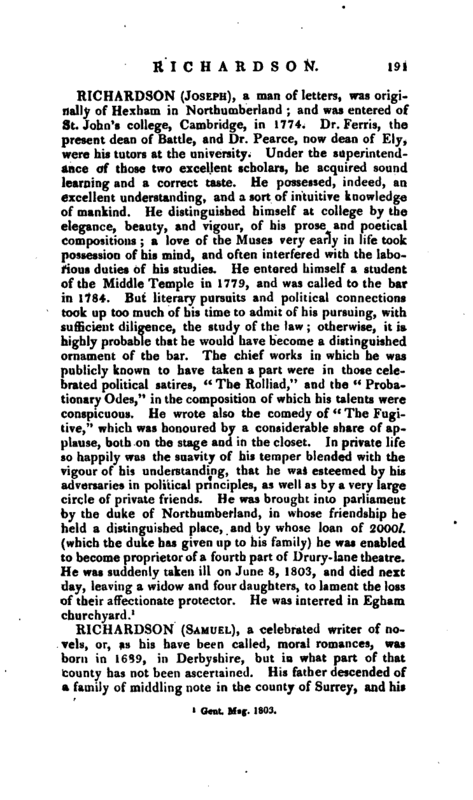 Richardson himself, by temperance and tranquillity of mind, enjoyed a life, protracted amidst the blessings of domestic friendship, to the advanced age of eighty, and then died, May 23, 1745, respected and lamented. He had had, a short time previously, a paralytic stroke that affected his arm, yet never disabled him | from taking his customary walks and exercise;-iind it was after having been in St. James’s park, he died suddenly, at his house in Queen-square, on his return home. He had a son, with whom he lived in great harmony; as appears by the joint works they composed. The father, in 1719, published two discourses; i. * l An Essay on the whole art of Criticism as it relates to Painting.‘’ 2. “An Argument in behalf of the Science of a Connoisseur.” In 1722, came out “An Account of some Statues, Bas-reliefs, Drawings, and Pictures, in Italy, &e.” The son made the journey; and, from his observations and letters, they both at his return compiled this valuable work. 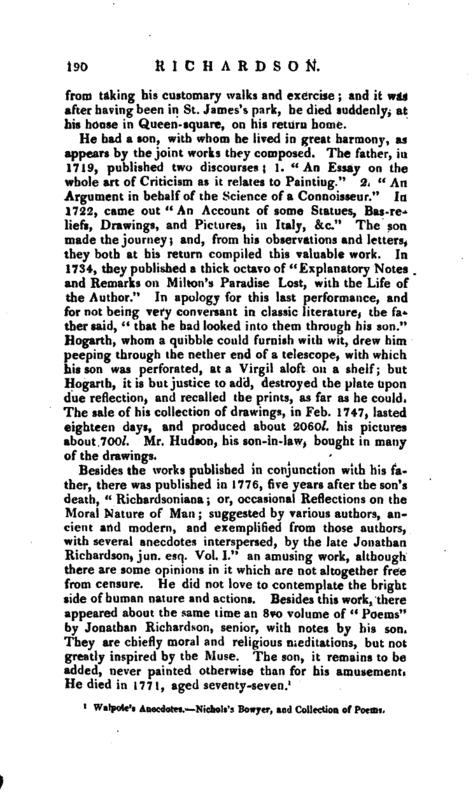 In 1734, they published a thick octavo of “Explanatory Notes and Remarks on Milton’s Paradise Lost, with the Life of the Author.” In apology for this last performance, and for not being very conversant in classic literature, the father said, “that he had looked into them through his son.” Hogarth, whom a quibble could furnish with wit, drew him peeping through the nether end of a telescope, with which his son was perforated, at a Virgil aloft on a shelf; but Hogarth, it is but justice to add, destroyed the plate upon due reflection, and recalled the prints, as far as he coukL The sale of his collection of drawings, in Feb. 1747, lasted eighteen days, and produced about 2060l. his pictures about 700l. Mr. Hudson, his son-in-law, bought in many of the drawings. 1 Walpole’s Anecdotes, Nichols’s Boiryer, and Collection of Poem?.